Susan Minot's novel Evening is a complex exploration of the fragmented and disordered memories of a dying woman, focusing on the weekend of her friend's wedding and the tragic events that occurred. Michael Cunningham is an acclaimed novelist and screenwriter with a talent for creating fascinating and fully developed female characters and a penchant for bisexual love triangles. One would think that when these two writers worked together to adapt Evening to the screen that the results would be a modern masterpiece. Instead, Evening, the second film from German director of photography Lajos Koltai, is a complete and utter mess. Constantly and sloppily transitioning between the past and the present, Evening is never able to take a full grasp on what parts of the story it is trying to tell, and what message it is trying to convey through that story. The story sifts through the mess of Ann Grant Lord (Vanessa Redgrave), who is on her deathbed, watched over by her two daughters (Toni Colette and Natasha Richardson) and her nurse (Eileen Atkins). Ann relates to her daughters' memories of her youth (played by Claire Danes), her friendship with Lila Wittenborn (Mamie Gummer) and Lila's brother Buddy (Hugh Dancy), who is madly in love with Ann. 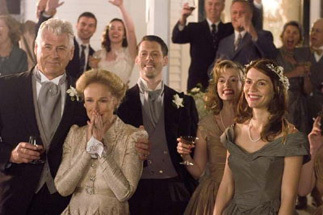 At Lila's wedding, Ann's friendship with Buddy becomes strained when Ann falls in love with Harris Arden (Patrick Wilson), who is also the secret love of Lila and, though he is too afraid to admit it, Buddy. As it becomes more complicated at every turn, with love affairs turning into love triangles and then into other, even more complicated shapes better suited to a geometry class than a movie, Koltai, Cunningham, and Minot lose control of their story. Perhaps the worst decision was the inclusion of fantasy sequences intertwined with Ann's memories, which add nothing to the story but to further complicate everything and slow down the pace of the film, which is already almost fatally slow. What's worst is that these sequences never seem believable, and instead serve only as distractions from the film's plot, without giving us any more insight into Ann's emotional development.